The Dutch crew, skippered by esteemed round the world yachtsman Bouwe Bekking, were speeding up after making it through a light wind patch lying 200 miles from the finish line ahead of their rivals. At 0700 UTC their lead had been reduced to just seven miles, pressed hard by Franco-Chinese outfit Dongfeng Race Team, but by 1300 the new breeze had allowed them to double that. 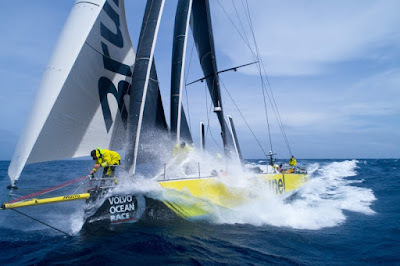 Brunel had just 182.2 miles to go at the 1300 UTC position update, having led the fleet on the 5,600-mile leg from Itajai, Brazil, since exiting the Doldrums a week ago. If Brunel were to hang on it would be their second consecutive stage win having taken the top spot in Leg 7. However, despite Brunel’s lead, helmsman Kyle Langford is predicting a photo finish. Across the fleet the crews were today preparing for one last big push. “We now have 30 hours of hard work, strong winds, light winds, big transitions and lots of sail changes,” said Dongfeng skipper Charles Caudrelier. “All the team is in inshore mode and on standby. We have to keep this second place or pass Team Brunel, but ahead of us we face a very tricky situation and there are lots of options and maybe a re-start in light air in 12 hours’ time. Having climbed through the fleet over the past few days, at 1300 UTC MAPFRE had overhauled Dee Caffari’s Turn the Tide on Plastic in the rankings to move into third. It’s a cruel blow for Turn the Tide on Plastic crew, who have pushed for the top spot all leg and led at times, but skipper Dee Caffari said she wouldn’t stop fighting until the finish. The Volvo Ocean Race tracker will remain live until the end of the leg, showing race fans the exact positions of the fleet as they battle for Leg 8 glory. The latest ETA for the leading boats is 0600 - 1000 UTC at the moment.